Firstly I wanted to say a big thank you to everyone who reads this blog. I was totally overwhelmed by the number of people who got in touch, from every part of the world. I am really sorry but I simply could not buy everyone a tshirt. There were simply too many requests and I do feel bad about it. The design is below and if you fancy ordering and paying for your own, please visit www.clothes2order.com and you can choose your own tshirt. Purchase my design on Clothes2order.com! I chose pink for women and olive for gentlemen. 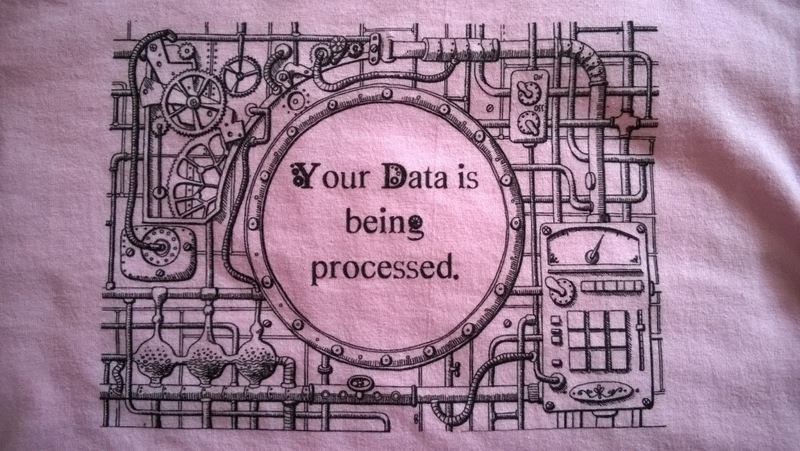 If I didn’t email you back to offer you a tshirt, I have missed your mail in amongst the traffic and I am sorry about that. Enjoy! If you do order one, please send me a photo of yourself in it and I will post it up. I’d love to see it! 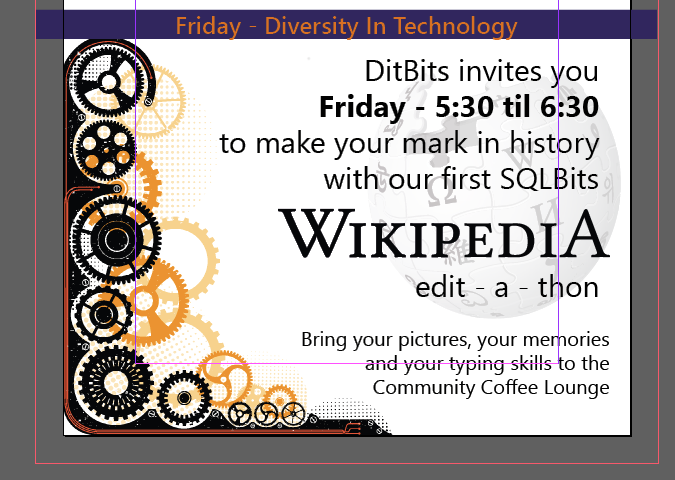 Interested in helping SQLBits to craft the first ever SQLBits Wikipedia page? Exciting DitBits news from the SQLBits camp today. 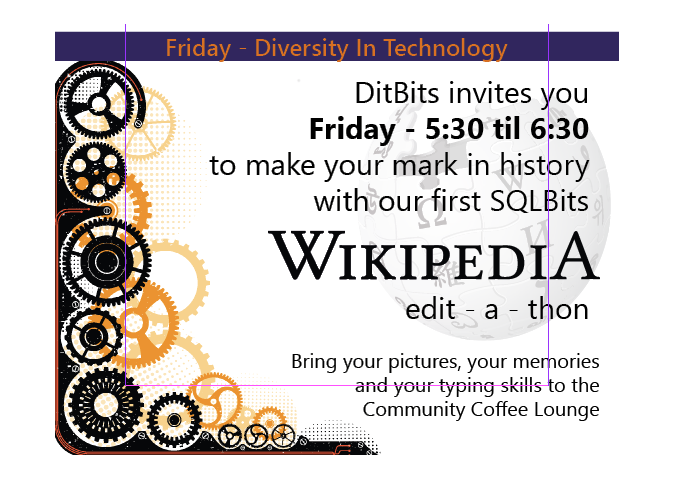 We will be hosting a ‘Wikipedia Edit-A-Thon’ which will focus on gathering budding community authors, editors and reviewers together to create the first ever Wikipedia SQLBits page! I’m looking for photos for the SQLBits photo album, which we will be posting online. Please send your photos, or links to photos, to me at jen.stirrup@sqlpass.org and I promise not to laugh at your old photos if you don’t laugh at mine! We will see you in the Community Coffee Corner at 5.30 – 6.30 on Friday 18th July! Diversity isn’t just a ‘nice thing to do’ – studies show that it is a way forward for companies to perform better, and even increase the bottom line. Studies by psychologists such as Irving Janis, and social psychology experiements by luminaries such as Solomon Asch, show that diverse teams make better decisions. The complexity scientist Scott Page has looked at mathematical models. Here, Dilbert is commenting whether these companies are well run because their Boards are diverse, or do well-run Boards decide to appoint diverse boards? It is a horse and cart question. Using mathematical models, he was able to link diversity to productivity and innovation. Furthermore, research by McKinsey, an international management consultancy firm, has shown that diversity makes for better decision-making at all organisational levels, with companies with women in top management performing better operationally and financially compared to other companies in similar sectors. The McKinsey study also shows that diversity is especially important for problem solving and innovation, which are both extremely relevant for IT. Diverse teams find more innovative solutions, get stuck less often, and are able to find a solution faster because they have different perspectives within the team. In fact, diverse teams even outperform teams of experts, as experts are often trained to think in the same way. I used to think that companies sought me out, as a female technical blogger, strategist and implementor, because they were being ‘nice’ and wanted to tick a HR box somewhere. I now recognise that they wanted to hire me because, simply put: Diverse companies make are looking at innovative ways to make more money. The ‘nice’ bit is all very… nice…. but the bottom line is that they want diverse teams to increase their bottom line. Communities have an influence on who we are, as an individual. Diverse settings aren’t always easy to navigate, however. In the Women in Technology session, we will be looking at dealing with situations where you see or experience social exclusion, and how to promote teamwork in a diverse settings. These are all hard management tasks, and the WiT lunch will discuss these difficult issues. If you are serious about a management career, these are things which you could end up tackling – so why not get sensitive to them now? If you are already a manager of people, then you will want to know how to get the best out of your team, and have a positive impact on them and on your organisation. The Women in Technology lunch is a great place to start learning, or be challenged about your ideas. So, if you’re interested in moving from your DBA role in tech towards a management role, or you are already a manager, then you need to be aware of diversity and it’s importance in an organisation. To come back to our original question: companies are well run because their Boards are diverse, or do well-run Boards decide to appoint diverse boards? The data shows that the diversity leads to stronger teams, better problem solving, innovation, and understanding your customers better. Diversity isn’t a pretty thing. It’s a real driver for businesses, and smart business recognise a good thing when they see it. And that’s why you need to attend the Women in Technology lunch at SQLPass Summit 2013. You are here to learn and network, and the diversity discussion will help you to be prepared for diversity discussions when they occur in your workplace.